The hunt for a substance to replace whole blood in transfusions has been underway since the late 1960s. The search has so far been unsuccessful, but research continues because success would eliminate several major problems in using fresh blood. These problems include a supply shortage in the face of increasing demand, the short shelf life of "whole blood" even under refrigeration, transmission of hepatitis, the AIDS virus, and other viral diseases, and the need for careful blood typing. The primary job of artificial blood is to duplicate the oxygen-carrying function of hemoglobin. Hemoglobin is the iron-containing protein within the red cells of natural blood. Researchers and manufacturers seeking to create artificial blood have concentrated on two things: so-called "white blood" using fluorocarbons, and "red blood" made from modified hemoglobin. In recent years, research into a successful artificial blood formula has been of great importance to many bio-medical research companies. amounts of oxygen. Their potential value was dramatically demonstrated in 1966 by American physician Leland C. Clark, Jr., of the University of Cincinnati. He dropped a live mouse into a beaker full of a liquid fluorocarbon. The mouse was held completely immersed in the liquid by a weight on its tail but continued to breathe. The oxygen dissolved in the liquid is what made this possible. Early fluorocarbons could not be used in human medicine because they concentrated in the liver and spleen. Ryoichi Naito, a chemist at the Japanese pharmaceutical firm of Green Cross, found he could overcome this problem by mixing perfluorodecalin with the fluorocarbon perfluoro-propylamine. The result was a milky white solution called Fluosol-DA. In 1989 Fluosol was approved by the U.S. Food and Drug Administration (FDA) for use during balloon angioplasty.. During the time the inflated balloon cuts off blood supply to some tissues, injected Fluosol can carry oxygen to the deprived tissue cells. Animal studies hold promise that Fluosol can be used to carry oxygen to tissues in other cases of blood circulation blockage. A different approach to blood substitution has centered on hemoglobin isolated from the red blood cell. Use of free hemoglobin was suggested back in the nineteenth century, but modern researchers several decades ago discovered that such use had several severe problems. Outside the red blood cell, hemoglobin holds on too tightly to oxygen and does not release enough to the tissue cells. Free hemoglobin also breaks down into two halves that are filtered out by the kidneys, which often causes severe damage. To eliminate these difficulties, researchers have worked on various ways of modifying hemoglobin. One approach has been to chemically link the hemoglobin subunits together. The linked subunits form a bigger molecule (a polymer) that will not break down. Although researchers were concerned that the giant molecules could damage body organs, animal tests were encouraging. Surgeon Gerald Moss of the University of Chicago licensed his technique for multi-molecule linkage to Northfield Laboratories of Illinois. In 1987 Northfield began clinical trials of the modified hemoglobin in humans. The first round of tests were successful. During the second round in 1989 several trauma patients suffered allergic reactions to the hemoglobin product. This prompted an FDA advisory committee investigation. The investigators learned of a German trial conducted by physician Konrad Messmer at Heidelberg University in the early 1980s in which the two volunteers suffered kidney failure after receiving a modified hemoglobin product. The FDA concluded that many organs of the body could be damaged by hemoglobin-based blood substitutes. The agency abruptly halted Northfield's human trials. English biochemist Max Perutz discovered hemoglobin's atomic structure in 1960. Somatogen Incorporated of Boulder, Colorado, used this knowledge to produce a genetically engineered, modified hemoglobin that gave up its oxygen more easily and did not break down quickly. Somatogen produced its hemoglobin in yeast or bacteria rather than human or animal substances. The company sought FDA approval for human testing in the early 1990s. 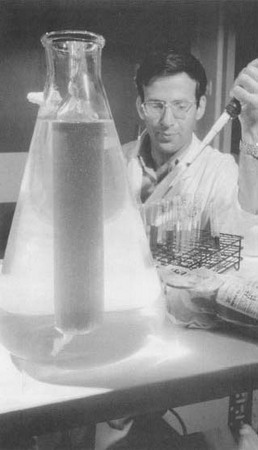 Biopure of Boston began working with modified hemoglobin from cows in 1984 and began human trials of its product in Guatemala in 1990. DNX, a biotechnology company in Princeton, New Jersey, announced in 1991 that it had produced genetically-engineered pigs that made normal human hemoglobin. Some components of plasma, too, could be synthesized by the early 1990s. Genentech of California produced a plasma that promotes coagulation in hemophiliacs. All these approaches hold promise for artificial blood. Researchers still remain uncertain about the cause of the toxic side effects produced by hemoglobin blood substitutes. They are not sure whether the side effects are due to impurities in the products or to the body's reaction to free hemoglobin. I need to know about hemoglobin blood.I need information about this so if you have any details about this one so send me mail this one. We want to get more information about buy the artificial blood. I have sickle cell and i would like to know more about artificial blood and can it help me. i m doing my research proposal work on the topic " artificial blood". How we can produce immunity by artificial wbc in to artificial blood ?? Is it possible to make different wbc cells with the help of nanotechnology ? ?